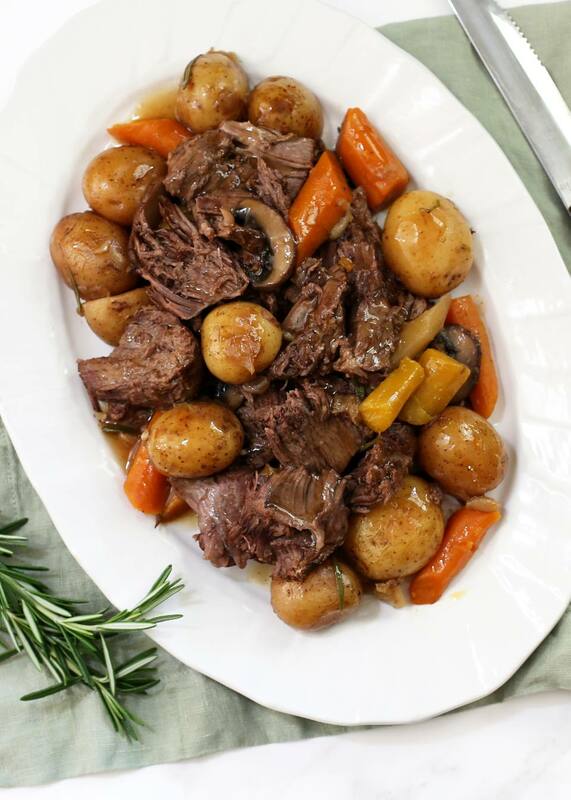 This recipe for oven-baked 7-bone pot roast and vegetables gets a boost from cola which creates an incredibly rich gravy. You won't taste cola, but the gravy is to die for! You can substitute any brand of plain cola, but do not use diet soda. This recipe also will work well with other chuck roasts if you are unable to find a 7-bone roast. Directions also are given to prepare the roast in a slow cooker. Prepare a 13 x 9-inch baking pan by lining it with foil. Heat oven to 350 F.
Sprinkle 7-bone roast liberally with salt and pepper. Heat a large, heavy-duty skillet until very hot, add the olive oil, and quickly sear the 7-bone roast on both sides. Place seared roast in foil-lined baking pan. Surround with potatoes, mushrooms and carrots in an even layer. Spread sliced onions evenly over the top of the meat and vegetables. In a bowl, mix together cola, beef broth, onion soup mix, paprika, oregano, and garlic powder until well combined. Pour evenly over meat and vegetables. Cover tightly with foil. Roast for 2 hours. Remove from oven and let rest at least 15 minutes. Carve meat. Serve with vegetables and pan gravy. Note: Use the same method in a large oval slow cooker, cooking on low setting for 6 to 8 hours. Or, omit the vegetables (except the sliced onions), and cook the 7-bone roast alone as a main dish.